Every single one of us has experienced or will experience the devastating effects of terminal illness at some point in our lives. For me, it was having to watch my best friend lose her Dad when she was still only in her 20s. That feeling of being powerless to be able to stop her from hurting is something that will remain with me forever. So when the Whitley Bay Fundraising Group for Marie Curie got in touch to ask me to help them with their fundraising in North Tyneside as part of the Great Daffodil Appeal, I thought of my friend and immediately said yes. I have always wanted to do more for charity, but, as I'm sure we all do, I'm forever making the same old excuses - not having enough money to make a difference and not having any spare time to volunteer. Marie Curie offer care and support to those with terminal illnesses and their families. Nurses work night and day offering much needed free support in people's homes and in their nine hospices across the country (we are very lucky in the North East to have a hospice in Newcastle). 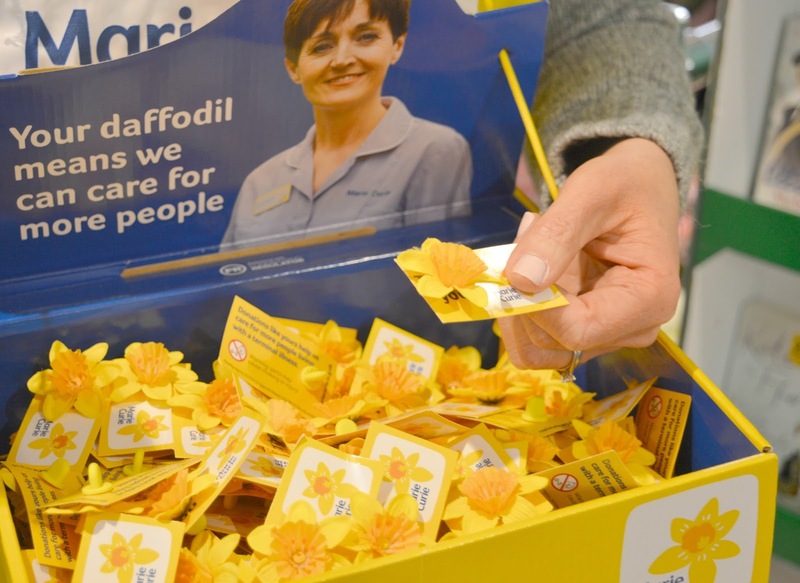 Last year Marie Curie helped more than 50,000 people living with terminal illnesses. 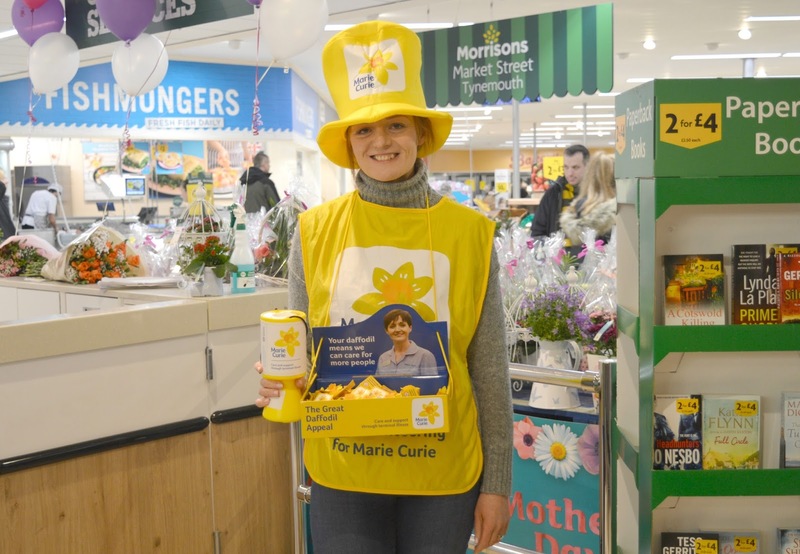 The Whitley Bay Fundraising Group for Marie Curie are a group of volunteers who host events and organise collections to raise funds for the charity around the North Tyneside region. They invited me along to help them out with a collection at Morrisons in Tynemouth, it was easy to sign up online and I could pick a location and time that was convenient for me. Shifts are only 2 hours long so easy to fit into your day. My shift began at 10:00 am on Saturday morning and I was instructed to turn up at Morrisons in Tynemouth for a quick briefing and to collect my essentials. I will admit I was very nervous! As an introvert I'm not a huge people person and the thought of talking to complete strangers was a little scary. Talking to people I don't know definitely isn't high on my agenda for a Saturday morning but I'm a great believer in pushing yourself out of your comfort zone, and knowing how important the cause was I put on my most confident smile and strode my way out to the checkouts at Morrisons. Before I began my shift I'd been worried about annoying people by having to rattle my tin and approach them but volunteering for Marie Curie really isn't like that. All I had to do was offer people a friendly smile and they approached me. I was overwhelmed by the amount of people that came over to say hello and buy a daffodil. Within the first five minutes a Dad with his two young girls came over to put some money in my collection tin. My heart went out to him as he explained to his daughters that they were giving me money because Marie Curie had helped their Nana when she was very ill. 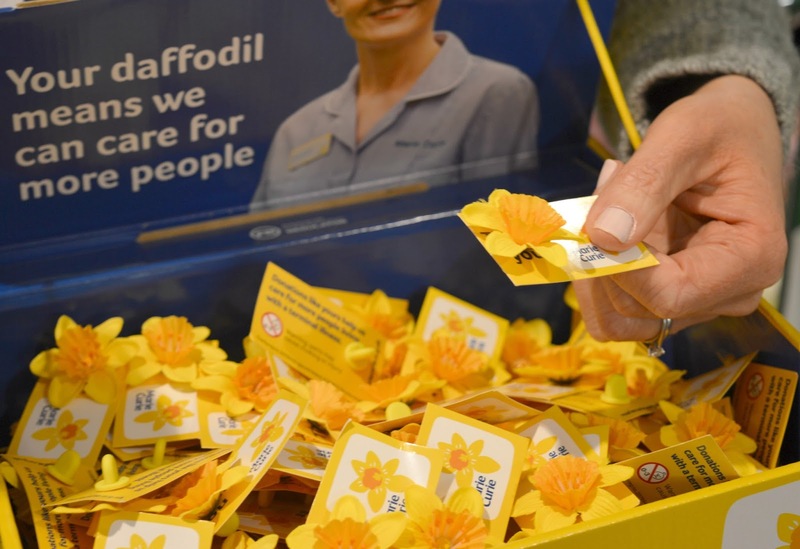 The longer I stood collecting money the more I realised how many people Marie Curie have helped. I loved the children that came over to say hello and how happy they were when I offered them a daffodil in exchange for their money. It immediately reminded me of something that I had long forgotten - my Mum always gave me coins for the charity tins when I was younger, I loved the feeling of pushing the money into the tin and getting a sticker, badge or flower in return. I had been a little worried before volunteering that people would come up and ask me questions that I didn't know the answer to but before my shift I was sent a really helpful pocket guide with answers to the most frequently asked questions and although I didn't end up needing any it was great to know exactly what the charity does and why we were collecting money. Knowing that every £20.00 I was collecting was paying for a nurse to help someone for an hour was a great incentive to carry on smiling! 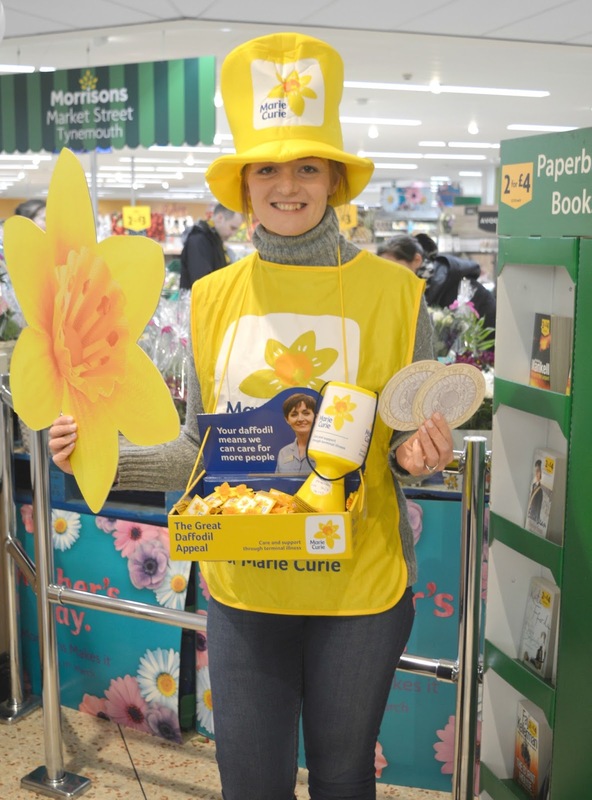 I'm usually busy rushing about the supermarket and barely notice charity workers who stand by the tills so I was amazed by the amount of people who struggled to put down their heavy shopping bags to take a moment out of their day to buy a daffodil. It really made me take a few moments to think about myself and how I really should take more notice of what's happening around me. * It was the perfect way to people watch! Who wouldn't love 2 hours to just stop and watch people - I saw all sorts! * I felt like I was doing something to help my local community and as someone who is very passionate about the North East and how great our region is that was pretty special. * I'm pretty sure my arms got a very good work out as soon as my tin got heavy! * Joint your Local Fundraising Group - click here to find out more about your nearest local fundraising group and you can join them. I left Tynemouth feeling like a different person, volunteering with Marie Curie changed everything. It's made me realise that we can all do something to make a difference. I felt powerful and so overwhelmed by the love and kindness of strangers. In every day life we're too quick to judge, we get angry and mad over nothing, bury our heads into our phones, ignore what's around us .. I'd like to think that thanks to Marie Curie I'll take the time to stop and think more about others and play my part in trying to make our home in the North East a better place. When I received an e-mail I was shocked to discover that I'd managed to collect £145.86 in my two hours collecting, that's enough to pay for just over 7 hours care! We truly can all do our bit to make a difference, no matter how small it may be and I would encourage anyone reading this to take a couple of hours out of their lives to volunteer for Marie Curie. I honestly kept forgetting it was on my head then someone would mention it and I'd be like "eh?!" then I remembered! I'm definitely going to volunteer again, it didn't feel like 2 hours, the time just flew and it was actually fun! You are a star!! How amazing of you to do this and to share for everyone to learn from. ah what a lovely thing to do. volunteering is so rewarding isn't it? Yes, and so eye opening! I've already had a look where I can volunteer closer to home! Thank you lovely, I needed the push but it's definitely something that I'd like to do more now! Oh wow that's a great idea! I definitely want to sign up and volunteer again when I have a spare weekend, I really enjoyed it! It was so enjoyable so it didn't really feel like a big deal, I'm definitely going to do it again!